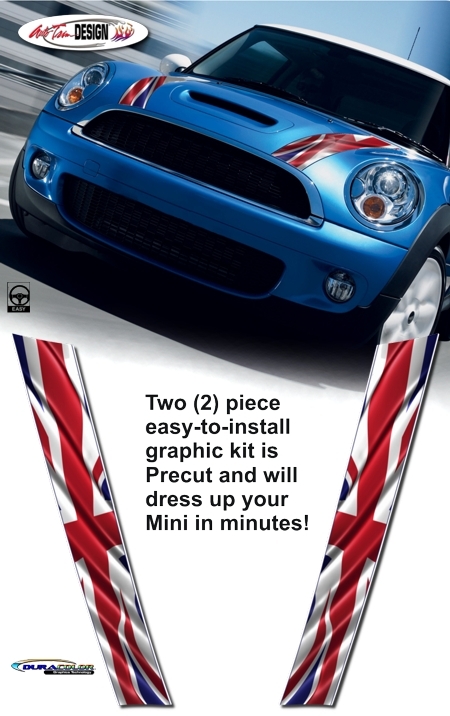 Make your '01-Current Mini Cooper stand out from the rest of the pack with this unique easy-to-install waving Union Jack Flag Hood Graphic Kit. Kit is packaged as a set of two (2) pieces that are PRECUT and ready to install - NO TRIMMING required! Digitally printed with our DuraCOLOR graphic technology with a high definition image, kit is manufactured with premium automotive grade vinyl film materials. Flag design features a fine Blue outline with White trim at each side. As a further step, graphic is covered with a 2.5 mil clear laminate which provides protection from miles of abuse. This stripe package is not just a set of straight strips in a box. Our graphic kit consists of prefitted and contoured pieces that are specifically made for the '01-Current Mini Cooper factory hood area and will not fit any other vehicle. Please refer to chart below for correct vehicle fitment.